The Encomium which the blessed Abba Theodotus, Bishop of Ancyra (d. c. 445) in Galatia, pronounced on the day of the glorious commemoration - which is the twenty-third of the month Pharmuthi - of Saint George, the martyr of Diospolis of Palestine, the sun of the truth, the star of the morning, the mighty man of the Galileans from Melitene and the valiant soldier of Christ; and he showed forth his family relationships and the mighty conflicts which he endured, and the honours which he received in heaven; in the peace of God, Amen. It is meet and right and fitting for our souls, O holy beloved, that we should commemorate the sufferings and honourable contests of the saints, and more especially of Saint George the mighty, the most excellent and honourable athlete and warrior - whose festival we celebrate to-day in this glorious commemoration - who has shown himself to us approved by God and loveworthy before men, by reason of the righteous deeds which he displayed, through which he was worthy of being called into the healthful sufferings of Christ and of bearing wounds in his body for Christ's sake. He was perfect in great endurance, and mighty valour, and a pure heart, and in giving up his entire will to God through the great zeal which he had in his heart towards God, and in the fear of Him which he had within him, which bore fruit plentifully to Him a hundredfold, sixtyfold, and thirtyfold. Moreover, he forsook his own will, and the multiplying of his great wealth, and his servants, and all his riches, and hearkened unto the voice of God, and took up his cross, and walked after our Lord Jesus, following after Him with an upright heart. On this account he received so great an honour from Christ that He spake to him with an oath, saying, "Among all the martyrs who have existed there shall not be one like unto thee in heaven, neither shall there be any like unto thee for ever." He burned with the Holy Spirit and performed his daily life witrh zeal that he might be among those that are chosen and that benefit out souls. In short, he performed the whole will of God and put himself beyod the reach of every thought which could offend the soul. He lived in the service of God, and was remote from the vain sights of this life which are like dreams and which pass away quickly like shadows. For this reason he longed for heaven, remembering what the blessed Paul said, "If ye be risen with Christ, seek after the things which are above, where Christ sits at the right hand of God," and "Remember the things which are above and not those which are upon earth." Neither his father's rank of Count, nor the high birth of his mother, nor the glory of his soldierhood could overcome the decision of the truly noble and holy Saint George, neither could any one of these lead him astray or seduce him to forsake his piety and firm decision and perfect faith. The grace of God perfected him in every thing concerning which he was anxious, and he feared God who watched over him, and God strengthened him on every side, like a precious stone of admant, that he might never be moved. On this account when the time of persecution came, the heart of the holy Saint George was ready, and when God called him into the holy contest he was prompt to obey. Moreover, he went to the holy contest and marched through it by himself; and when they tortured him he became valiant, and was firm and resisted his enemies. He fought with impious governors and received the crown incorruptible for ever, and an imperial sceptre and royal throne from the true and holy Bridgreoom our Lord jesus Christ. And not only himself, but multitudes of souls received crowns through him during the seven years in which they tortured him. 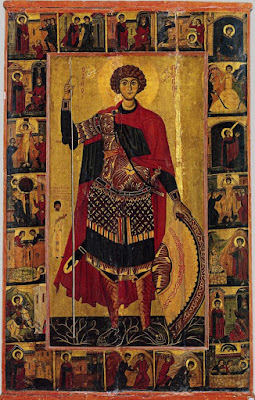 If God in His true knowledge permit us, we hope to make manifest to you in this encomium the exalted honours of Saint George, the valiant athlete and soldier of Christ, the holy and noble man of Melitene. For the subject under discussion weighs upon us and compels us to show you everything truly. My heart rejoices greatly within me this day and urges me to speak more especially in honour of Saint George the great luminary, whose festival is celebrated today throughout the whole world. To him the Lord testified by oath, saying, "I swear by Myself and by my Holy Father, and the Holy Spirit, that among all those born of women there is not one like unto John the Baptist, and that in the whole Army of Martyrs there is not one like unto thee, neither shall there be one like unto thee for ever. For thou shalt be more exalted than they all in the kingdom of heaven, and they all shall call thee, "George the beloved of God the Highest." I am afraid, O my beloved, to begin to speak in honour of this great illuminator and warrior, for I know the poverty of my intellect and the feebleness of my halting speech and that I shall not attain to the measure of his exalted and excellent contest. But I hope and trust that the Lord will send me the rays of the light of that valiant man to illuminate my heart and to quicken my halting tongue, that I may speak a few words in his honour to a Christ-loving congregation. and since the description of the honour of this valiant man, O beloved, is above the conception of every man upon earth, more especially of my humble tongue, I, who desire to speak in honour of holy Saint George, the valiant martyr, need wisdom from the Lord and a celestial tongue that I may not omit anything of the mighty and exalted contests of that noble and valiant man, which he fought before all people through his great endurance and bravery. And also, he is honourworthy for each deed of valour which he wrought with great sufferings and a great number of contests: and if the Lord permit we will set before you a few of them. But meanwhile we will set before you the qualities of which we have spoken of this brave soldier of Christ, Saint George. And what are these qualities ? His upright and unwavering faith in God; his certain hope; his sincere love; his compassion for every one and the whole human race; his gentleness to all creatures, both great and small; his benignity; his goodness; his zeal; his patient endurance of the cares of this life; his good disposition and the joy of his soul; the blamelessness of his heart; his taking his stand at the tribunal boldly; his freedom of speech before the governors, entirely without shame or fear of man, as David the Psalmist said, "I will speak thy testimonies before kings, and will not be ashamed;" his patient endurance of tortures with great joy of heart; and the other sufferings which he bore for the sake of our Lord Jesus Christ. Of these contests we will set forth a few before you, as we promised to do in the beginning of the preface: the contests about which he heard that blessed voice of the Lord, saying, "As My Father has appointed Me a kingdom, so also will I appoint you who stand with Me in My temptation an unending and indestructible kingdom for ever." And again, "Ye shall eat and drink with Me in my kingdom." By reason of the words full of joy and every happiness Saint George was especially ready for the strife: and the remembrance of those good things made suffering light to him. He bore every thing with a ready will, for he was gladly prompt in every thing. Nothing stood in the way of his rigid resolution to suffer, for the sufferings of this world prepared him for the good things of the world to come, and patient endurance prepared for him the crown incorruptiblefor ever in heaven. We have extended our preface until now, O beloved, and have not as yet set forth before you the glorious and marvelworthy sufferings of Saint George the athletic martyr of Christ who warred and fought against impiety. But now we will proclaim to you the things which we have set down, together with those which we shall say after them. Now it came to pass in times of old that when Dadianus, the great king of the Persians, had obtained sovereignty he ruled over the whole world. Now it is said of this tyrannical governor that he was lord of the whole world, but the true Lord of the world, Who is over all things and Who gave us this dominion was not known. And everyone carried his life in his hand for he knew that the devil, the father of all wickedness, was envious of our race at all times. Now when the devil saw the faith of Christ increasing day by day throughout the whole world, he was filled with great envy, and entered into the heart of that impious governor Dadianus, who was more wicked than anyone else on the whole earth, and who hardened his heart like Pharaoh of old and raised up a great persecution against all Christians. And he sat down and issued an edict to all the world in which was written as follows. "Inasmuch as a rumour has reached my ears that He whom Mary bore, and whom the ravening wolves of Jews slew, is to be worshipped and served by all people, and that Apollo and Poseidon and Hermes and Zeus and Artemis and the rest of the gods are not to be worshipped, I write to you, O all ye governors of the whole world upon whose head rests the authority of empire, that ye may all come to me with your followers, counts, generals, soldiers, tribunes and rustics, that ye may know what I wish to ask of you." And he sent copies of the edict throughout the whole world. And sixty-nine governors, each with his retinue, were gathered together from all parts of the world, and came to him at the end of five years: and when they came to him, the whole country was in an uproar by reason of the greatness of the vast and innumerable multitude of those who were with them. When that wicked tyrant saw that they threw themselves down at his feet and worshipped him and gave him gifts, his heart was puffed up exceedingly, and he roared like a lion: and he feasted with them for seventy days, and did not sit in judgement at all, for he feasted every day. After seventy days Dadianus, the impious, godless, and senseless governor, (and sixty-nine other governors, making seventy godless governors in all), sat upon the tribune and caused them to bring before him all the instruments of the torture-chamber; the instruments for trial, the iron bars (? ), the axes, the two-edged swords, the saws, the wheels, the iron hooks, the scrapers (?) of brass, the brazen cauldrons, the knives for splitting the tongue, the iron hands for splitting the bones, the large knives with saw-like edges, the workmen's chisels into which were fitted sharp pieces of iron, and other instruments of torture which we cannot describe. Now all these had been prepared by the governor for those days. And the tyrannical governor swore an oath before the sixty-nine governors and the whole army, saying, "If my hands find any persons throughout the whole world who are doubtful about serving the gods concerning whom we have given commands, I swear by the might of my kingdom that I will torture them with all these instruments which lie before me, I will smash in their skulls, I will saw off their legs, and I will take out their brains through their nostrils. And as for you, O governors, and everyone who hears me today, go ye all and worship the glorious gods that ye may receive the more honours from my majesty. But as for those who will not obey me and who believe on Jesus Whom the Jews crucified, I swear by the might of my kingdom and the crown upon my head, that I will lave all these instruments in the blood of their own bodies and in the blood of their sons and tender daughters, that I will confiscate all their property, and that I will burn them alive;" and the governors and all the multitude cast themselves down and worshipped the polluted gods. When all those who believed in God heard of this oath they were dismayed and terror stricken by reason of the storm which had risen up against the church of Christ. Thus three years passed over the world without any one daring to utter from his lips the words, "I am a Christian;" and there was much tribulation of heart throughout the whole world, and no-one uttered the name of the Lord from his mouth. But listen, O beloved, and I will declare to you what happened after these things, for it is time to lead you to this honourable man and champion of Jesus Christ; this valiant conqueror; this verifiable pearl of God; this new David who destroyed Goliath, which is the devil and his wicked dragon; this sun of truth in the heavens; this [luminary] whose radiance and light illuminated the whole world; this man whose festival is celebrated today throughout the whole world. Saint George, the beloved of God and His angels, came from the country of Cappadocia and was the son of the governor of Diospolis. His father, an exceedingly orthodox man, died and left the righteous man, then ten years old, and his two sisters, one of whom was called Kasia and the other Mathrona. Now they were exceeding rich in gold and silver; and they had menservants and maidservants in exceeding great numbers, and immense herds of cattle, and fine horses, and countless flocks of sheep. In short, there were none like unto them in all Palestine and its borders, and all the city loved them because of the good deeds which they wrought for everyone. Shortly after the death of Saint George's father, a new governor was appointed over the country of Palestine in his stead; and he was a great lover of God. And he knew of the rank of the righteous man and of the good birth of his parents, and he had no child except a daughter two years old. When he came into the city with a mighty following, such as befiited his dignity and honour and greatness, he sent and fetched the holy youth, Saint George, and kissed him many times, and wept for the removal of his father by death. And afterwards he entreated his mother to give him Saint George that he might be to him as a son, and that he might appoint him general over all the multitude that was with him; and she gave him. And he sent him to the king with one hundred soldiers, and he wrote to the king concerning him and showed him his rank and the good birth of his parents. When the king had read the letter he rejoiced in Saint George greatly, and immediately appointed him general over five thousand men, and wrote down that he should receive three thousand pieces of money every month besides his taxes for the public treasury which were remitted to him; and the king sent him back to the eparch with much royal pomp. When Saint George came back to his house, the whole city and the eparch came out to meet him, and they carried him into his house with great joy. On the morrow his mother spread out a feast for the whole city, for rich and poor alike, male and female, small and great; andshe distributed much money among the widows and orphans. Then she invited the eparch and all his company and made a great feast for them three whole days. And the eparch wrote down Saint George as his son and the heir of every thing that he possessed, and he betrothed his daughter to him, and made him lord over all his house: and he was associated with him in the affairs of government, and lived with him until ten years were ended. When Saint George had completed his twentieth year he was so exceeding strong and valiant that he was the leader in the fight, and there was no one among all the company of soldiers who could be compared with him for strength and beauty. and the grace of God was with him, and He gave him such beauty and strength that all those who saw him marvelled at his power and youth. When he went into battle he was a terror to those who saw him and to those who stood up against him, and when he rushed upon the battle array of the enemy [seated upon] his horse, he carried his drawn sword in his hand, and cried out to then, "I am George of Melitene and I come against you in anger;" and straightway the weapons of battle fell from their hands, and he destroyed them all, and carried away their spoil. In short, God was with him in all his ways. When Saint George had completed his twentieth year, the eparch was anxious that he should celebrate his marriage with his daughter; but he did not know that Christ was keeping him a pure virgin bridegroom for Himself. While the eparch was meditating these things in his heart, he went to his rest in God, and left every thing that he had to Saint George. And the good God wished to lead this very valiant man to Himself that His holy name might be glorified in him, and He made this suitable counsel come into his heart, saying, "Behold, I hear that Dadianus the governor has gathered together a number of governors to him in the city of Tyre in respect of the boundaries of the empire. I will arise and take gifts and money, and will go and give them to them, and will ask them to make me eparch in the place of my fathers who have passed away." So he rose straightway, and took much money and many gifts, and put them in a ship with himself and his servants, and went to the governors. When the saint had come to them he left his servants in the ship with all the baggage, and came up to the governors at once. And he met the lawless Dadianus, and saw the idols before him and people offering up sacrifices to them with great zeal. And he was stupefied entirely for a long time and said within himself, "Why did I leave my own house and the beauty of a Christ-loving city in which they worship the Lord of heaven and earth by day and night, and come to these profane and lawless ones who have forsaken God and worship Satan ? Why did I seek the rank of count grom the hands of these godless and lawless ones ? Cursed be these polluted lawless governors and their dominion, which shall pass away in a moment, with them ! I know that the Lord will receive me to Himself, and I will not seek a destructible kingdom of this world, but I will seek the kingdom of my Lord Jesus Christ which endureth for ever; and I will not return to my native city to my mother. And now enough of my life in this world, for I will rely upon my Lord Jesus Christ, who endureth for ever, in His goodness to give me strength to die for His holy name, and to take my bones again to myplace of sojourning upon earth, and to lay them in the sepulchre of my dead ancestors." When Saint George had meditated these things in his heart he returned to the ship to his servants, and told them everything that was in his heart. And they entreated him, saying, "Master, if it is to be so let us return to our city with the ship, and let no one know for what purpose we came hither." Saint George said to them, "Far be it from me to return to my house to look upon the face of my mother again, but I will die in this place for the holy name of my Lord Jesus Christ, the king of heaven and earth and that which is beneath the earth, the Lord of all things. And now receive ye your freedom and your wages, and swear to me by God the true Almighty that ye will not return to my house again while I am alive, lest muy mother and my sisters know of my condition, and bring only death upon themselves. But now receive ye your wages and take each one of you three pounds of gold and ten changes of raiment and go wheresoever ye please in the whole world, my city alone excepted. And if ye are alive and hear that I am dead, do me the kindness for Christ's sake to take my body to my native city and bury it." When the servants of the blessed man George had heard these things they wept a long time, but afterwards they saluted him [and went their way]. Now one of them did not return to Diospolis until the holy man consummated his martyrdom, and three of them dwelt with the holy man in the city of Tyre to witness his strife. And the blessed man distributed the great wealth which he had brought among the poor and the infirm, and the gifts which he had brought for the governors he gave awy entirely to the destitute; and he gave away his very clothes to the naked. Then Saint George leaped among the impious governors and cried out, saying, "I am a Christian openly, and I fear not your madness, O governors of violence, for your gods are devils; may the gods who have not made heaven and earth perish from under the whole heaven and let every one who worships them hold his peace. !" When the dragon of death, the lawless Dadianus, looked upon him and saw that he was refined in body and fair in face as the light of the moon when she shines, and that he was altogether handsome in his form like precious, pur, white, alabaster, he knew straightway that he was well born and that he was the son of an eminent eparch; and he rose up speechless, marvelling at his youth and his gentle answers. And he answered and said to him, "All we upon the earth are filled with all the good things of the gods, and we are very dear to them, and thou thyself art numbered with us in honour and majesty, and by thy noble bearing thou showest that thou art of exceeding high rank. And now be it known to thee, O beloved one, the beauty of whose countenance I love, that during the three years which I and the sixty-nine governors whoom I have gathered together from all parts of the world, have been sitting here, during these three years I say, we have not heard such a word as "Christian" uttered throughout the whole world until this moment. I know in my heart that thou art most noble, and that thou art mighty in thy strength and in the multitude of thy riches; but neither the other governors, nor the multitudes which surround them will regard thee with the same respect. But now, let the matter be manifest to thee, O noble one, it is not only we and the governors that thou hast despised, but thou hast also despised the righteous gods themselves; it is meet therefore for thee to repent, and to be changed in heart, and to worship the gods that they may forgive thee thy first ignorance. As for us and the governors, we will take thee to ourselves as one of our beloved sons, and thou shalt receive from the gods and from us all the greatest honours and imperial rank; and thou shalt be ruler over ten fine cities with their suburbs from whatever part of the world thou shalt choose them." Saint George the truly blessed man answered and said to him, "Cursed art thou, and the lawless governors who are with thee, and the foul idols to which thou givest the name of gods ! they are not gods but devils, perish thou and they together !" And the governor was enraged and said to him, "I spoke to thee as a father speaking to his son, and I advised thee for thine own honour and welfare; and thou hast despised us like a stupid and silly man. But tell me, Whence comest thou ? What is thy name ? What is the name of thy god ? What are the names of thy parents who brought thee into the world ? Why hast thou come hither ?" Now the blessed man did not wish to reveal his name nor the lofty rank of his parents. And the governor and all the other governors said to Saint George, "O beautiful youth, we adjure thee by Jesus Christ, whom thou callest God, to tell us what is thy name, and the name of thy parents, and the name of thy city, if those who begat thee are alive, if thou hast brother or sister, what thou seekest and for what purpose thou hast come to this city ?" Now because they had adjured Saint George by the name of Christ, he declared, saying, "Inasmuch as ye have adjured me by the name of my God I am unable to hide anything from you. I am a Christian, and the son of a Christian, and no one of my family was ever an idolator. My father was Anastasius the governor of Melitene, and was the son of John the chief governor of Cappadocia. When the emperor saw the valour of my father Anastasius, he demanded him from his father John, the governor of Cappadocia, and appointed him governor over Melitene and the whole country of Palestine. My father Anastasius was twenty-five years of age when he received the office of governor, and the emperor gave him a company of three thousand armed soldiers for the maintenance of his authority over the whole country of Palestine. And Anastasius sought out a noble lady, after the superior rank of the people of Melitene, among the great ones of the town, whom he might take to wife in holy wedlock. And they advised him, saying, "In all this city there is no one meet for thy rank and dignity and greatness except Kira Theognosta, the daughter of Dionysius, the count of Diospolis, who is associated with the rule of your majesty, for she is a virgin aged eighteen years, and there is no one [of like rank] in the whole country of Melitene except her father and his house." And Anastasius commanded, and they straightway brought her father Dionysius, and he gave him her dowry - twice her weight in gold - and many presents, and male and female servants. To her he gave raiment and gardens and fields and vineyards which could not be confiscated, and he took her to wife, and he loved her exceedingly so that he forgot Cappadocia and his parents; and he lived in Palestine until God visited him there. When my mother, Kira Theognosta, the noble lady, bore me to him, he called my name George after his father's father. And again my mother bore him my two sisters, the name of the one was Kasia and that of the other Mathrona. My blessed father, Anastasius the governor, went to his rest and left me when I was ten years old; one of my sisters was six years old and the other two. After this another governor whose name was Justus, was appointed in the room of my father, and he took the place of my blessed father to me; he moreover appointed me general over five thousand soldiers, and wrote my name to the king to receive three thousand pieces of money every month, and he knew nothing of what was in his house, except what he ate and drank, for it was I who ruled his possession and his house; and he betrothed me to his daughter that I might take her to wife in happy wedlock. And while he was purposing to carry out our marriage the time of all men came upon him, and he departed from the sojourning of this vain life, and I buried him in the sepulchre of my blessed fathers; may God grant them everlasting rest, Amen ! As for myself, I carried out my military duties satisfactorily, and by the skilful working of my lands and the generosity of my mother, I acquired wealth, and with wealth came honours, and then in a ship of my own I came with my servants to this city to present gifts and offerings to you and the other governors that ye might make me governor in the room of my fathers who have passed away. But when I saw that ye had forsaken the God of heaven and earth who had granted royalty unto you and that ye served Satan, I said in my heart, "Let every kingdom which proceedeth from Satan and his children - which ye are - perish !" And I gave all my gifts and possessions to the lesser brethren of my Lord Jesus Christ, who are more worthy of them than you, and I came to you to chide your folly, for the things which ye worship are not gods, but foul devils. Now, behold, I will inform you of the whole matter, I am a Christian boldly; whatsoever ye desire to do unto me, that do." When the governors heard from him that he came from Melitene of Cappadocia, and that he was the son of the chief governor, they were afraid. And they spake to him with flattering words, saying, "O youth, we know thy rank and the good birth of thy ancestors, come now, listen to us, and let our advice be acceptable unto thee. Offer sacrifice unto the gods, that thou mayest receive from them not only the office of governor held by thy ancestors, but also the rulership over the whole world which we will give thee. Furthermore, next in order to these governors present, thou shalt appoint whomsoever thou thou pleasest to be counts in every province of the whole world, and they shall be generals and commanders and leaders under thy authority in every place." The just man answered, and said, "This counsel of yours is exceedingly wicked, for it would lead me to destruction with you. And now, O lawless ones, tell me to what god ye desire me to offer sacrifice?" Dadianus replied, "George, we wish thee to offer sacrifice to Apollo who spread out the heavens." The blessed man answered, "If Apollo had in truth spread out the heavens, thou couldst rightly have called him "God"; and if Poseidon had in truth made fast the earth thou couldst rightly have called him "God" likewise. Art thou not ashamed, O godless, wicked one and dragon of hell, to call this impure and diabolical idol by the name of "God"? I will now make mention of some of the saints, not for thy sake nor for the sake of the godless governors who are sitting with thee, but for the sake of these multitudes who are here present. To whom, O governor, wouldst thou compare Apollo? Wouldst thou compare him to the great Peter, the Arch-apostle to whom were given the keys of the kingdom of heaven? Or wouldst thou compare hoim to the mighty Elijah the Tishbite who was an angel upon earth, and who was taken up to heaven in chariots of fire? Is he not more excellent than the wicked sorcerer Poseidon? or Smaraktos (Scamandros?) the profane who worked enchantment by fire? and who lived with the defiled one, whom they call Timetia (Demeter?) who gave birth to the Saraphin the sea warriors, who on account of their deeds were cast into the abyss of the sea? In whom wouldst thou believe, O king, in Jezebel who slew the prophets, or in the most exalted Virgin Mary who bore us our Lord Jesus Christ ? Be ashamed then, O foolish one, for thy wicked and impure gods are devils." When Dadianus the governor heard these things he was greatly enraged, and he commanded them to strip off the clothes which he had on and to tie a girdle round his loins and to hang him upon the wooden horse and to torture him until his bones protruded through his skin. Now he was twenty-one years and three months old, and it was on the first day of the new moon of Pharmuthi that they began to torture the righteous man. And his holy body was disfigure with blood; but the blessed man bore such fearful sufferings as these with patience and fortitude. And they forced iron boots upon his feet and drove iron nails into them; and his blood flowed forth like water. And again they threw him upon his back, and laid a stone weighing six hundred pounds (?) upon his belly until it burst asunder and his bowels poured forth upon the ground. And they beat upon his head with iron-headed bars until his brains poured out through his nostrils white like milk. But he was of good cheer in all these sufferings, for Christ strengthened his soul within him. And again they brought iron knives the edges of which were like saws, and they sawed his flesh into threads with them; and Dadianus commanded them to bring salt and strong vinegar, and to pour them upon his wounds. Then he made them lacerate his body with hair bands until his bones protruded, and his flesh fell in pieces on the ground; but the blessed man did not die, for God stengthened his spirit within him. And they threw him upon a wooden bed, and they drove twenty nails through his body into the wooden bed; and they lifted him up senseless, and carried him into the prison. And multitudes of those who were standing by in those days wept for his beauty and his stature and his youth, saying to each other, "Alas for the beauty of this youth from Melitene, and the comeliness of his noble body which the lawless ones are destroying with fearful tortures, such as they have brought upon him this night." And when they had gone to their homes they spake to their wives and children, saying, "Verily we have to-day seen with our eyes in what manner and in what form ........"; and the whole city was talking about him that night. And it came to pass that an angel of light appeared to him in prison in the middle of the night, and there was a great earthquake and the city was moved to its very foundations. And behold God came into the prison with thousands of his holy angels, and the whole place was filled with exceeding precious incense. And God called to Saint George, saying, "George, my beloved, rise up healed and without corruption, from the couch on which thou sleepest;" and he straightway leaped up without any pain in his body, and he was like one who had risen up from a royal feast. Then he cast himself down and worshipped the Lord, but He took hin by the hand and raised him up, and saluted him lovingly, and laid His hand upon all his body, and filled him with strength, and said to him, "O beloved one, be strong and of good cheer, for I will be with thee until thou hast put to shame these lawless kings. I swear by Myself, O George My beloved, that as there has never arisen among those born of women one greater than John the Baptist, so there shall never be any one among the martyrs that can be compared with thee, or be like unto thee. And behold these seventy lawless kings shall torture thee for seven years, and thou shalt do many mighty deeds, and shalt die three times, and I will raise thee up again: but on the fourth time I will come to thee on a cloud of light with the celestial hosts and the Prophets and the Apostles and the holy Martyrs, and I will bring thee to the place of safe keeping which I have prepared for thee." When the Saviour had said these words to him, He gave him the salutation of peace and filled him full of joy; and He went up to heaven with His angels. And the blessed man was looking after Him and rejoicing greatly and blessing God until day-break by reason of the words which God had spoken to him. When it was morning, the lawless governor and those who were with him commanded that they should go into the prison and see if the righteous man was alive or not. When they opened the door of the prison they saw the saint standing up praying, and his face shone like the sun, and they marvelled greatly and ran and told the governor everything; and they commanded them to bring him up on the tribune. While they were bringing him the saint said, "My God, my God, hasten to me, O my God, why hast thou forsaken me, my God, haste thee to deliver me." When he had come to the tribune, he said, "O tribune, O tribune, I and my Lord Jesus Christ have come to thee and thy Apollo." And when the lawless ones saw him they marvelled, and said to him, "How is it that no harm has come to thee ? and who has healed thee ?" The righteous man said to them, O lawless ones, Ye are not worthy to hear with your orofane ears the name of Him that has healed me." Then Dadianus was furious with rage, and commanded them to tie the saint to four high stakes and to give him four hundred lashes on his back, and after that to turn him round, and to give him four hundred lashes on his belly; and his lacerated flesh fell to the ground piece by piece and his blood ran like water. And Dadianus made them bring hot ashes and lay them on his body, and pour vinegar and naptha over his flesh; and he caused eight soldiers and five military tribunes to watch over him in prison until the next day. Now the fire was kindling in the whole body of the blessed man, and he was in great suffering. And the Lord Jesus Christ saw his sufferings and that he was unable to speak at all, and came down from the summit of heaven and spake with him, saying, "I am strenthening thee, O My beloved George, stand forth from all thy sufferings and be of good cheer, for I am with thee." And the righteous man arose, and God laid His hand upon all his body and healed him, and He gave him the salutation of peace, and went up to heaven in glory and honour; and the blessed man sang psalms in prison until the morning. When the soldiers and the tribunes who were guarding him saw what had happened to the saint and that he was strong they marvelled and told the governors. Dadianus the governor said, "George is an arch-magician, but I will hear no more of him until I can bring an arch-magician more powerful than he." And he straightway sat down and wrote a rescript, saying, "Dadianus the governor writes to the whole world, greeting. Let any magician who has the power to put an end to the magic of the Christians come hither to me, and I will give him one hundred pounds of gold, and two hundred pieces of silver, and every sort of possession, and he shall be second in my kingdom;" and this rescript was read in every place. And behold there appeared before the governor a magician, whose name was Athanasius, saying, "O king, live for ever ! Command this man called George to perform something before thee, and I will destroy his magic." Dadianus rejoiced greatly and said to the magician, "What thing wilt thou do in my prsence that I may know that thou canst overcome the magic of this Christian ?" Athanasius said to the governor, "Command them to bring me an ox;" and he commanded them to bring an ox. And Athanasius spoke some words into the ears of the ox, and he split asunder into two pieces. The governor laghed, and said, "Verily thou art able to vanquish the magic of the Christians." Athanasius said to the governor, "Let tem bring me a pair of scales." And when they had brought them they threw the parts of the ox into the two pans of the scales, and they came out equal to one another. Then Dadianus the governor caused them to bring Saint George to him, and he said to him, "It is for thy sake that I have summoned this arch-magician into my kingdon; thou must either overcome his magic or he will overcome thine." Saint George said to the governor, "The Christian who has taken refuge in Christ never works magic, O impious one." And the saint said to the magician, "Hasten, my son, and what thou desirest to do unto me, do speedily; for I see that the grace of God has drawn nigh unto thee." Then Athanasius took a cup and filled it by his magic, and invoked the powerful names of demons over it, and gave it to Saint George to drink; and when he had drunk it no evil happened to him at all. Athanasius said, "O George, I will give thee another cup, and if no evil happens to thee I myself will believe on thy God." And Athanasius the Magician took the cup and pronounced the names of demons more evil than the first over it, and gave it to the righteous man; and he drank it, and no evil happened to him at all. Then Athanasius threw himself down at the feet of the saint, and said to him, "I conjure thee by Jesus Christ to give me the sign of the cross of Jesus Whom thou servest that He may open to me the kingdom of heaven." When the holy martyr saw his faith, he struck the earth with his foot, and there welled up a stream of water filled with an exceeding precious odour. An the blessed man prayed quietly, and Thomas the Apostle came and baptized Athanasius the magician in the name of the Father and the Son and the Holy Ghost, and he obtained the remission of his sins. And the Apostle gave them the salutation of peace secretly and him himself from them; and straightway the fountain of water returned to its place. When the governor and those that were with him saw what had happened they were silent and marvelled. And Athanasius cried out before the governor, and said, "I am a Christian, and I thank God and his servant George, that He hath numbered me - the workman of the eleveneth hour - among His servants, and I hope that His mercy will receive me through the prayer of George the holy and mighty martyr." And the lawless governors were enraged, and they commanded that Athanasius should be taken outside the city and have his head cut off with the sword: so he consummated his martyrdom on the 23rd of the month Tobi, on the Sabbath day; may his holy blessing be with us all for ever and ever, Amen. And the righteous man turned to the governor, and said to him, "Do unto me whatsoever thou pleasest." The governor answered, "By the gods, O George, I will make an end of thee." And he made them gather together workmen and materials (?) to make an exceeding high wheel, and he made them fix in it one hundred sword blades, each a cubit long, and they filled it entirely with very sharp iron knives, and drove deadly iron spikes and hooks into the flat part of the rim of the wheel. And he caused two flat tables to be made [beneath] the wheel having parts filled with spear heads and nails, and parts filled with cooking knives having edges like saws; and there were two poles of olive wood which fitted into cavities, and twenty men worked each pole [to turn the wheel]. Then Dadianus commaned them to bring the blessed man to him, and when they had brought him, he said, "Behold, George, if thou wilt worship Apollo thou shalt receive a sceptre of royalty from me; but if thou wilt still belong to Christ then look upon this machine which I have made, and into which I will cast thee in order to put thy body to the test, O thou valiant soldier !" The saint said, "I belong to Christ; do unto me whatsoever thou wishest." Then Dadianus commanded them to put him on the wheel and that forty men should make it revolve. When the blessed man saw the instrument of torture which was fixed in the wheel, he feared for himself because he carried flesh which was exceedingly tender; and he said within himself, "I shall not escape with my life this time." Then he straightway spread out his hands and prayed, saying, "I praise Thee, O my Lord Jesus Christ, and I give thanks unto Thee that Thou hast esteemed me worthy of the wonderfulness of healthful sufferings, even as they crucified Thee, my Lord, upon the cross and set Thee between two thieves. And behold they have made a double tearing wheel of torture for me for Thy holy name's sake, O my Lord; Hearken now, O Saviour, to Thy servant George. O thou Being unsurpassed from all time, O Thou unchanging crown of the martyrs, Who hast spread out the heavens like a chamber, Who in wisdom pourest out dew upon all creation when it is parched and dried up; Who hast made the clouds drop down rain upon the earth, on the just and unjust alike; Who hast weighed the mountains and hills in a measure and scales; Who hast rebuked the disobedient, wicked, and lawless ones and hast cast them into th4e lowest and darkest part of Amenti, where they now are in the bondsand fire of Amenti and are tortured by wicked dragons, rebuke, O my God, all these impious ones, and let nothing stand against Thy command! O Thou Who in the last days didst appear to us upon earth and didst take flesh through the God-bearer, Mary the Virgin, by an unfathomable and unknowable mystery; the true offspring [of God]; Who didst walk upon the waves of the sea and Whose feet were not wetted by them; Who with fives loaves of bread didst feed five thousand men, and they were satisfied; Who didst rebuke the sea and the waves and they subsided everywhere, and were obedient upon Thee, for all creation is Thine; let now Thy mercy come upon us and upon me, Thy servant George, for with Thee there is mercy, and to Thee and to Thy Good Father and to the Holy Spirit belongeth the glory for ever. Amen." When he had said, "Amen", they threw him on the wheel and he fell down upon the cutting machine, and they dragged him over it once, and he was speedily put an end to; and his bones and his flesh were destroyed. Then the tyrant cried out befor the governors who were round about him, and said, "There is no god save Apollo and Hermes and Zeus and Herakles and Athene and Scamandros and Poseidon; these are they who have established the heavens, who give dominion to kings and who make the mighty to have power upon earth. Where is now St. George's god, whom the magistrates of the Jews slew ? Why has he not come to deliver him out of my hands?" And Dadianus commanded them to take the fragments of his bones and flesh, and the earth which had drunk his holy blood, and to throw them into a dry, waterless pit; and they piled up dirt over it, saying, "Lest the Christians find a fragment of his body, and work miracles therewith." And Dadianus and the sixty-nine governors arose, and went in to eat, rejoicing that they had overcome their enemy. Then straightway the whole air became black and the sky was covered with clouds, and there were thunders and lightnings, and the whole earth shook to its foundations. And the holy archangel Michael blew with his trumpet, and the Lord came upon a chariot of the Cherubim with thousands of angels, and stood by the pit. And the Lord said to Michael, "Speak unto this pit, saying, "Give me the blood and the bones and the flesh and the pieces of the righteous man George", for he said, "I shall not escape with my life this time", that he may understand with all his heart that I am the God of Abraham, and the God of Isaac, and the God of Jacob;" and Michael laid them before Him. And the Lord took the bones in His hand, saying, "O my son George, the hand which fashioned Adam is now about to fashion thee, my beloved." And He breathed into him and gave him the breath of life; and Saint George arose from the dead; and the Lord embraced him and gave him the salutation of peace, and went up to heaven; and Saint George was looking after Him. And he arose and came to the lawless governors and the soldiers who had thrown him into the pit, and said to them, "Know, O lawless ones, that I am George whom ye slew and cast into the pit." When the impious Dadianus had considered him, he said to the soldiers, "It is his shade." Magnentius the governor of Armenia said, "It is not his shade, but it is like him." Anatolius the general said to them, "Are ye not ashamed, O godless ones, to hide the truth ? Verily this is George, the servant of the living God, whom my Lord Jesus Christ, the Son of the living God, has raised up from the dead; and therefore I, and all the soldiers who march with me, believe on my Lord Jesus Christ." Then the impious Dadianus was enraged and commanded them to take them outside the city, and to divide them into ten parts, and to slay them with the sword. In this manner they consummated their martyrdom on the twenty-third day of the month Mechir, and received their incorruptible crowns. Now there were martyred three thousand soldiers and Anatolius the general and nine thousand people of the multitude who were standing by, male and female, and Saint George stood by comforting them all until they had nobly consummated their martyrdom: may their holy blessing be with us all for ever, Amen. After these things Dadianus commanded them to throw him on to an iron bed and to fasten him to it by stakes driven through his back. Then he made them fill a brazen vessel with lead and heat it until the lead was as liquid as water, and he made them open the mouth of the Saint and pour it boiling hot into his belly; but no harm happened to him. Then the impious one commanded them to pull the stakes out of his body and to hang him up, head downwards, from the branch of a tree, and to tie a stone to his neck: and he passed ten days and ten nights hanging down until his blood ran out of his nose like water. When ten days had gone by Dadianus the tyrant took him down, and there was a little breath left in him. And he made them lay him upon the ground and hack his body with a sword from the sole of his foot to the crown of his head; and they hacked him to pieces. Then he made them beat his head with hatchets until it split asunder, and they cut off the top of his head and his legs with axes. And he made them bring a large red-hot iron rod and thrust it through his right ear, and some servants came and drove it through his head until it came out on the other side: and they lifted him up like one dead to carry him to the prison. Now the righteous man was in prison, and was suffering great pain by reason of the tortures of his holy body, and at the third hour of the night when the holy man was in agony the Lord Jesus Christ came to him in prison with His holy angels, and the whole prison was full of light. And the Lord said to him, "George, behold, I command thee to arise and stand upon thy feet healed;" and he straightway arose, and he was whole. And the Lord embraced him, and laid His hand upon his whole body, and filled him with comfort, and said to him, "Arise and go to these impious governors and put them and their gods to shame; be of good cheer and fear not, for I am with thee always. And I say unto thee, O beloved George, that there shall be joy in heaven over thy endurance, and the angels shall rejoice over thy good fight. Behold now thou shalt endure the tortures of these impious governors for six years, and shalt die [thrice]; but the third time I Myself will come with My holy angels and will receive thy soul, and will make thee to lie down in the bosom of Abraham and Isaac and Jacobin the Paradise of their joy;" and when the Lord had spoken these things to him, He gave him the salutation of peace and went up to heaven in glory, and Saint George was looking after Him. And he passed the whole night in prayer until the day broke. When the morning came, the lawless governors commanded them to bring Saint George to the tribune. Magnentius the governor said to him, "O George, I want to see a sign at thy hands, and [if thou do it] verily, by my lord the Sun and by the Moon and by Artemis the Mother of all the gods, I will believe upon thy God, Jesus Christ." [Saint George said to him,] "I know that thou dost never speak the truth, but tell me what thou wouldst ask now." The governor said to him, "Behold there are seventy thrones here [made] of different sorts of wood, of which some bear fruit, and some do not. If these, through thy prayer, bud and put forth roots, and the trees which bear fruit are distinguished from these which do not, I will believe on thy God Jesus." And straightway Saint George bowed his knees and prayed to God. When he had said "Amen", the Spirit came upon the thrones and they budded and put forth roots. Those which bore leaves and fruit, and those which did not bear fruit sprouted with leaves [only]. When Dadianus and the other impious governors had seen what had happened through the righteous man, they were greatly ashamed, and they cried out, saying, "A great god art thou, O Apollo, for thy manifestest thy power in dry wood." And the lawless governor commanded them to put Saint George upon a brass bed and he made them bring two iron nails, each a cubit long, and make them red hot and drive them through his two shoulders into the bed. Then he made them bring an artificer to split his head open with an iron axe, and he made them pour boiling pitch through the opening until it filled his body and ran out through his mouth(?) and ears and from under him. And immediately the fire kindled in his head and in all his body he became as a dead man. And they drew the nails out of his shoulders and cast him into a brass "ox", and they heated the "ox" which the blessed man was in for three days with vine and cypress wood. And the Lord looked upon the sufferings of the righteous man and came to him upon a cloud, and extinguished the fire under him, and healed all his body; and the brazen "ox" split asunder. And the blessed George came forth like one who had been bathing in a bath, and the Lord embraced him, and filled him with strength, and gave him the salutation of peace, and went up to heaven in glory; and Saint George was looking after him. Then the blessed man stood up before the governors without any blemish upon him. And when the multitude saw what had happened they cried out, "One is the God of George, O Jesus Christ, help us." Then the governors caused the multitude which stood round about them to be beheaded with the sword: thus five thousand souls consummated their martyrdom and received the crown of life on the tenth day of Phamenoth. And the holy man was encouraging them until they consummated their martyrdom in the peace of God, Amen. After these things the governors commanded them to bring bundles of thick vine stakes which they sharpened with knives, and when they had set the righteous man upon a stone, they stuck them into his holy body, and they gashed his thighs, and stuck them in them. then they pulled out the nails of his hands and feet, and pricked the places with the sticks, moreover the attendants thrust two sharp sticks up his nostrils into his head. Then they rolled him on the stone and the sticks went into his holy body until his blood ran down upon the ground like a stream of water; and the righteous man suffered greatly during this torture. And then he made them fasten him by his back to a plank of wood and put another plank on his belly, and they nailed the two planks together and so held the saint fast between them; and they brought a huge iron saw and sawed him in two from his head to his feet; so he gave up the ghost. And immediately the governors saw he was dead they commanded a large brass cauldron to be brought, and the body of the saint with his blood and all his flesh and anything of it that had adhered to the sticks and the teeth of the saw to be thrown into. Then they threw lead and asphalt and pitch (?) into it until the flames mounted up to a height of more than fifteen cubits. Now the cauldron was placed in a pit dug in the earth to the depth of thirty cubits. And the governors commanded them to pile up earth over the cauldron and the pit to the height of nine cubits, and they built a fortress for the governors over the pit, saying, "That the Christians may not find the least particle of one of his limbs, or they will build a martyrium over it." And when the attendants were going away, behold there was a great trembling in the air, the sun became dark and the stars appeared at mid-day [p. 300]; and the Lord came down from heaven with thousands of angels, and the choirs of the saints, and the twelve Apostles were with them and David the king and all the Prophets. Now the whole place was filed with so great a light that all those coming into the city, and even the impious governors, saw the light which fell full upon their faces. And the Lord came to the place where the cauldron was and commanded the archangel Gabriel to cleave the earth and to bring up the cauldron. then the Lord cried out over the ashes of the bones of the righteous man that were in the cauldron, saying, "George, George, I am the God who raised Lazarus from the dead, and I now command thee to stand up and come forth from the cauldron;" and the righteous man arose straightway and stood up perfect without any defect in him at all. And the Lord embraced him and filled him with power and consolation, saying, "O George, My beloved, be strong and endure; for I have established a throne for thee in the heavenly Jerusalem, the like of which there is not among the thrones of all the martyrs which have been from the beginning; and there shall never be like unto thee among those who are yet to come, O George, My beloved." And all the multitude of the Prophets and of the Apostles came forward and saluted him, and said to him, "Verily, thou art blessed, O George, the beloved of God and His angel and of the Cherubim and the Seraphim, and we glorify ourselves in thee and in thy great endurance, and especially because thyself alone hast confessed the name of God in boldness throughout the whole world and the fullness thereof: for this reason our Savior will confess thee in heaven, and thou shalt dwell in unspeakable glory before the face of the whole creation of heaven and earth." And he was filled with joy, and the Lord gave him the salutation of peace, and He went up to heaven with His angels and all His saints in great honour and glory. And the blessed man came into the theatre of the city with his face full of light, and he cried out, saying, "O all ye governors, and ye that are with them, O all ye soldiers and every person in this city, come forth all of you and look upon me, for, by the might of God, I am alive. I am the Galilean George from Melitene; I am he whom the godless governors slew and buried in the earth; but my Lord Jesus Christ raised me up from the dead, for He is the God of heaven and earth." When the multitude knew that it was George they cried out, saying, "There is no God in heaven or earth except Jesus Christ the God of George of Melitene." And a certain woman among the multitude whose name was Scholastike, who saw the miracle which had taken place, believed and cried out to the martyr, saying, "O my Lord George, my son was yoking his ox to plough in the fields when it fell down and died; and now, O my lord, help us, for we are poor." The righteous man said to her, "Take this little stick which I now hold in my hand, and go to the field and lay it upon the ox, saying, "George, the servant of the Lord God says, Rise up, O ox, from the dead";" and she did as Saint George had told her, and the ox lived. And she glorified God, and continued with Saint George. Now there was a multitude of people standing round Saint George who was teaching them the knowledge of Christ; and they cried out, "One is the God of Saint George the valiant soldier of Christ the King." The governors said to the soldiers, "What are these loud cries which we hear ?" and a soldier said to them, "It is for Saint George who has risen from the dead, and the multitude cried out, believing that his God had raised him from the dead." When the governors heard that George was alive again they were wholly stupefied and feared greatly; and they said to each other, "Perhaps it is not he." The soldiers said, "Behold we will bring him to you that ye may know of a certainty that he is George the soldier." And they brought the saint to the throne with the whole multitude following after him and crying out, "We are Christians boldly;" and they cursed the governors, and were enraged at them. And the governors commanded the soldiers to attack the multitude, and they slew them from the third hour of that day until the tenth hour of the next day; and the number of those who received the crown on that day was eight thousand five hundred souls, and they entered heaven with glory; may their holy blessing be with us all for ever, Amen! After these things the governors turned to Saint George and said to him, "How didst thou rise from the dead?" The blessed man said to them, "My Lord Jesus Christ, for whose sake I have suffered all these tortures upon earth, raised me up from the dead." And one of the governors whose name was Raklilos answered and said to the righteous man, "Verily I marvel at thee how thou hast come forth from this cauldron when thou wast fragments, and hadst been buried in the earth. And now thou wouldst desire that I should believe on thy God in respect of the thrones which budded, but we do not know if it was thy God who wrought this miracle on our gods. And behold there is here, a rock sepulchre in which some of the ancients have been buried; now if thou prayest to thy God and He raises them up alive I myself will believe upon him." The blessed George said, "I know that thou wilt not believe except by the fire which shall consume you all, nevertheless for the sake of the multitude standing here I will make manifest the glory of my Lord Jesus Christ. Arise, then, thou and those whom thou wishest, open the tomb and bring hither before this multitude what is therein, that the name of my true king may be made manifest today." Then Rakillos the governor, and Dadianus the governor, and Dionysius the governor of Egypt arose and opened the stone tomb, and brought out the rotten bones of those who were dead. And the governors said to him, "O George, the bones are rotten and have fallen to dust by reason of the length of time [they have been buried]. The righteous man said to them, "Bring hither the dust"; so the three governors made the attendants carry the bones and the dust which they found and bring them and lay them before Saint George. Then the blessed man bowed his knees and prayed to God, and straightway there was a mighty earthquake and lightning and thunders, and the Spirit of God came over the earth and the bones and the dust. And there came forth from the dust five men and nine women and a little child: and great fear came upon the governors and the multitudes who were with them by reason of the miracle which took place, and they were all alike frightened. And the governors cried out to one of those who had reason from the dead, and said to him, "What is thy name ?" He replied, "My name was Boes." The governor said to him, "How many years is it since thou didst die ?" and he that had been dead replied, "Four hundred years." They said to him, "Had Christ come into the world when thou wast alive ?" and he said to him, "Not yet." And the governors said to him, "What god didst thou worship ?" and he said, "I worshipped the god Apollo, a deaf and blind and soulless idol. And it came to pass that when I died they threw me into a river of fire [which flowed along] in the depths of hell and which consumed me mercilessly, and they kept me in its torturing waves for ...... years. And the idol Apolo was in it with me and inflicted great sufferings upon me, saying, "Know, O wretched creature, that I am not God, but a soulless idol. Why didst thou forsake thy God and worship Satan ? For this reason thou shalt now receive everlasting punishment with me." And after a time Jesus the Son of the living God came down into Amenti, and a cross of light went before him, and all Amenti shone with splendour. And He carried away all the captivity of those imprisoned with Him, and when it was the Lord's day, God looked upon the remainder of those who were being punished and gave them rest; but to us who served idols there was never any rest given at any time." When the governors and the multitudes had heard these things they were stupefied. And Dadianus the governor said to him, "By Apollo the mighty god, thy understanding has perished by reason of the strength of him which has passed over thee: come now, thou and thy brethren who have risen from the dead, and worship the great god Apollo." Jovinus answered and said to him, "Curses on thee, O profane dog, and upon thy polluted Apollo with thee." Then he that had risen from the dead threw himself at the feet of the saint, saying, "I beseech thee, O my lord George, the martyr of Jesus Christ, upon whim the armies of God have looked with desire to bring him to themselves in Jerusalem, the city of Christ, to give us all together the seal of Christ and the baptism of Christ; and I beseech thee, O my lord George, to pray for us that we may not return again to that place from which we have come." When the righteous man saw their faith, he stamped on the ground with his foot, and a fountain of exceeding clear water appeared, and they all received baptism in it by the hands of James the holy Apostle, the brother of John, in the name of the Father and the Son and the Holy Spirit. And Saint George made them go down into the sepulchre and they returned there; and they were perfect in peace and entered into the Paradise of their joy through the prayer of Saint George. And after these things the governors said to each other, "What shall we do with this magician ?" and they commanded to bring the saint to the tribune. When they had brought him they said to him, "By thy sorcery thou hast shown us devils in the shape of men;" so they laid him down and beat him with spiked clubs until his blood ran down upon the ground. Then Dadianus commanded search to be made throughout all the city until they found a poor widow woman whose like for poverty there was not in the whole city; and he made them put the righteous man in her house, saying, "I will disgrace the Galilean race." Now when it was morning the blessed George rose up, and found his body healed of its wounds, and the whole house was filled with light. When the soldiers who were with him in the house saw the great light they all fell upon their faces. And the Lord stayed His chariot over the place where the saint was and commanded the archangel Salathiel to minister to the righteous man; and the Lord filled him with strength and went up to heaven in glory. And Saint George took hold of the soldiers and raised them up and comforted them; and he sent them on their way in peace. Then he stood up in the house of the poor widow woman, and said to her, "Give me some bread to eat, for I have eaten nothing for six days." The poor widow answered, "forgive me, master, but I have no bread in my house." Saint George said to her, "What god dost thou belive on ?" The widow woman answered, "I believed on Apollo." The blessed man said to her, "Verily it is for this reason that thou hast no bread in thy house;" and the woman saw that his face was bright and shining like that of an angel of God. Then she said, "I will go and seek after bread for this holy man of God, peradventure I may find favour with my neighbours." When the widow had gone out the righteous man sat down and his face shone brightly, and his back leaned upon a wooden pillar close by him which supported one of the wooden beams that went into the roof of the house of the poor widow. And immediately the back of the righteous man touched the wood it took root, and budded, and forced its way up through the widow's roof, and towered up more than fifteen cubits above the greatest and the highest buildings of the city, and the archangel Michael came to him and brought him a table of food, and the blessed man ate and placed the heavenly bread upon the widow's table, and it was filled with exceeding choice bread; and Michael blessed her house and filled it full of all good things like the palaces of governors. When the woman came in and saw the face of Saint George shining like the sun, and the table filled with bread and all good things, and the pillar of wood that had budded, she said in her heart, "The God of the Galileans has come into my house to the wretched in spirit, and has helped my poverty." And she hastened and threw herself down at the feet of the righteous man and worshipped him, saying, "Master, have mercy upon me." Saint George answered and said to her, "Rise up, for I am not the God of the Galileans, but only his servant." The woman said to him, "If thou art His servant, and I have found favour in thy sight, O Master, let me speak before thee. The saint said to her, "Speak." The woman said, "I have a child nine months old, and he is blind, deaf, and lame, and I am ashamed to show him to my neighbours. His father died and left him when he had been conceived in me four months, and since I gave birth to him I have never allowed my neighbours to see him; if now, O master, thy mercy will help me I will believe upon thy God." The righteous man said to her, "The grace of God shall appear today; bring hither the child to me." And she brought the child from the third story of her house and laid him in St. George's bosom. And he prayed over him and made the sign of the cross over him and over his eyes, and breathed into his face; and the cales fell from his eyes and he saw immediately. His mother said to the saint, "Master, let him hear with his ears and let him walk." The righteous man said to her, "O woman, this is sufficient now; when I call him, he shall hear my voice, and shall walk and perform my words;" and she was unable to answer him a word, for she saw that his face was like that of an angel of God. Then the seventy lawless governors came out and walked about through the open spaces of the city: and when they saw the tree which, through God and Saint George, towered up fifteen cubits high above the city, they were all astonished together. Dadianus said, "What is this sight which has come to the city today ? and why has this great and lofty tree put forth its leaves here ?" They said to him, "This miracle has happened through George the Galilean;" and the governor commanded to call St. George to him. Then he made eight executioners flog him with four fourfold leather whips until his flesh fell piece by piece upon the ground, and his blood ran through his nostrils like water to the ground; and he made them bring blazing torches and put [them] under his body. And he made them bring a plank of wood and lay him upon it, and they nailed his body to it with seventy nails, and poured sulphur and pitch over it, and then set fire to it and made it blaze; so the righteous man yielded up his spirit; and his bones and his flesh were burned to ashes. Then Dadianus made them take his ashes up to a high mountain called Asurion, and they scattered them on the mountain to the winds. And when the attendants had turned back and were coming to the city, suddenly there were thunders and lightnings and a mighty earthquake so that the earth shook to its foundations. And behold, our Lord Jesus Christ came upon a cloud of light with all His holy angels praising Him; and He commanded the four winds of the earth to gather together the dust of the body of Saint George. And He cried out with a divine voice, saying, "George, My servant and My beloved, rise up from the place where thou liest, for it is I who command thee;" and straightway the blessed man arose like a bridegroom coming forth from his chamber. And the Lord embraced him, and gave him the salutation of peace and went up to heaven in glory. Then the blessed George ran after the soldiers, saying, "Wait a little for me, O my brethren, that I may come with you to these godless governors." When the soldiers saw him, they feared and marvelled and said with one voice, "O our Lord Jesus Christ, Thou art a mighty God; for Thy holy name's sake, O Lord, Thou hast raised up alive again the man who was burnt to ashes which were driven hither and thither by the winds." And they cast themselves down and worshipped Saint George, saying, "Master, give us the seal of Christ." When the blessed George [saw their faith] he commanded and there welled up a fountain of exceeding sweet water, and he prayed, and John the Evangelist came and baptised the ten (or twenty) soldiers; and the Evangelist blessed Saint George and the soldiers and disappeared from them. Then Saint George and the soldiers came together to the governors, and they cried out, saying, "Be ashamed, O godless governors, for behold Jesus Christ our Lord and God has raised up from the dead George whom ye scattered to the winds, and for this reason we all now believe on Him and are His soldiers." When the governors saw Saint George standing there they marvelled greatly and commanded to take him to prison until they had decided what to do with him. As for the soldiers, they gave Klekon and his three brothers, Lasiri and Dionysius and Joseph, to the wild beasts and they consummated their martyrdom: and they took off the heads [of the others] with the sword, and thus they consummated their martyrdom and received the imperishable crown on the second day of Pashons; may their holy blessing be with us all for evermore, Amen. After these things the governors commanded them to bring Saint George to them secretly that the multitude might not see that he was alive and despise them. When they had brought him they said to him, "George, we know now that thou art a mighty magician, and that there is no one like unto thee in all the world. But now, accept one hundred pounds of gold and go forth from this city secretly and let no one know it, that thou mayest escape these tortures and sufferings which thou hast suffered." The blessed man answered and said to them, "O filthy dogs, I forsook the great wealth that my parents left me, and which amounted to more than twenty thousand pounds of gold and forty thousand pounds of silver, my numberless cattle, my male and female servants, my many horses, my ships, my large vineyards, my olive groves, and my houses beautiful according to the opinion of this vain world; I left all these and my mothers and sisters for the name of my Lord Jesus Christ, and I endured all these sufferings at your hands for love of Him Whom I will never forsake. And now ye would advise me to take a thousand pounds of gold from you and to deny the God of the Christians, that I might go into the pit of Amenti, like you who are doomed to everlasting fire, and the devil and all his angels, for ever." When the lawless governors heard these things they were greatly enraged and commanded them to bring a shoemaker and his knife, and they cut the skin of his head in pieces; they brought two red-hot nails and drove them into his eyes and they thus dug out his two eyeballs; they tore out his tongue; and they put his feet in wooden fetters and broke his ankle bones with axes. Then they took him up and laid him in prison while there was still a little life in him, and with one accord they went their way together. And at midnight the Lord came into prison with His holy angels and laid His hand upon his whole body, and healed him and established him. And He said to him, "Be of good cheer, My beloved and holy valorous one, for I, and My Good Father, and the Holy Spirit are with thee, and the day is drawing nigh in which thou shalt receive the sceptre of the kingdom and the seven crowns incorruptoble for ever and ever." When the Lord had said these things to him He embraced him and filled him with might, and He went up to heaven in glory and honour. When Dadianus the governor rose up on the morrow, he said to the soldiers, "Go ye to the prison, and see what has become of this Christian sorcerer;" and when they had gone into the prison they found the blessed man as if they had not tortured him at all. And they cast themselves down and worshipped him, saying, "We beseech thee, O George, our master, to make us servants of thy mighty God." And he taught them concerning Christ, and through him they were worthy of the gift of holy baptism. Then they all came with Saint George to the governors, saying, "We are Christians and servants of Christ Jesus and God." When the multitudes saw Saint George standing there without any harm having happenred to him, and his face shining like the sun, they cried out, saying, "Verily there is no God in heaven or earth except the God of George, Jesus Christ our Lord and God, and from henceforth we are His." Then the lawless governors were greatly ashamed and enraged, and they commanded the soldiers to take them outside the city and to behead them with the sword: thus they consummated their martyrdom and received the crown incorruptible for ever and ever on the twenty-fifth day of the month Epiphi. Now they were two thousand four hundred and eight in number, besides the eight soldiers who received baptism: may their holy blessing be with us all for ever, Amen. Verily, my beloved, if I were to try to describe to you all the sufferings which Saint George the righteous and valiant soldier of Christ endured, time would fail me before I had recounted them all, for they are so many. Moreover a man who passed seven years in one place while seventy governors and their armies sat round him and tortured him is quite without parallel in all the world and the borders thereof. Verily I am astonished and I cross myself and I marvel greatly, O brethren, that I can narrate the marvel worthy contests of holy Saint George the great luminary, the beloved of God, the valiant man of Christ, who stood alone in the whole world, and whom none confessed save Christ. Saint George chided all the governors and rulers of the world and manifested that the Lord our strength is the God of every one. O George, my master, by what holy name shall I call thee? Shall I call thee "Prophet" or "Lawgiver" or shall I say "Apostle" or "Martyr" or "Righteous man"? In very truth thou art worthy, O beloved of Christ, to be called by all these names, but if I call thee "Prophet" thou excellest the Prophets, and if I call thee "Lawgiver" thou art also more excellent than the Lawgivers. They sawed Isaiah in twain with a wood saw once for the sake of the truth, and he died at once, so likewise with all the saints: but they sawed thee, O George, my master, with a two-edged sword [and they tortured thee] with the wheels, and the two-edged swords, and the axes, and for the truth's sake thou didst die [three] times. Moses the lawgiver saw but a little of the glory of God; but to thee, O George, my master, did God speak mouth to mouth in glory and honour. The Apostles who were twelve and seventy preached in all the world, each in his own country, and rebuked those who served idols and turned them to Christ: but thou, O brilliant star, hast by thyself rebuked the idolaters, and governors with their armies and the whole world, and hast overthrown them with the fire of heaven, and hast made the name of Christ to shine throughout the whole world. Thou art more exalted than all the martyrs together who have manifested forth works, and it is not I who say this but our Lord Jesus Christ the King of Kings Who testified concerning thee, saying, "O blessed one, as among those born of women there is none like unto John [the Baptist], so among all the martyrs who have been and shall be, there shall never be like unto thee forever. Thou art more exalted than the righteous by reason of thy patient endurance of hungerings and thirstings and imprisonments, and of the tortures which have been inflicted on thy body day and night for seven years and especially by reason of the purity of thy body. And, O Saint George, sun of the truth, verily thou art more exalted than all the patriarchs and judges, and, O beloved of Christ, I beseech thee not to despise the attempt of my feeble intelligence to declare thy exalted honour. Of a truth, I know, O beloved brethren, that neither I, nor the feeble Theodosius, nor those who will come after me, will be able to describe this valiant soldier of Christ by reason of the great torture which he received for seven years at the hands of seventy wild beasts; but, by the will of God, we will go back and complete our encomium that we may show you the end of the holy combat of the truly blessed man Saint George. And it came to pass after these things when the seventy governors saw that they had tortured the saint for seven years without having vanquished his firm resolve; and that they had slain him three times and that he had risen from the dead, they took counsel to take him by flattery: and so they commanded to bring the blessed man up to the tribune. And Dadianus the governor said to him, "George, I swear by my lord the Sun, and the moon, and by all the gods, and by their mother Artemis, that I will receive thee to myself like a beloved son and that I will give thee everything that thou shalt ask, even to the half of my kingdom will I give thee, if only thou wilt listen to me as to a father, and wilt worship Apollo once thou shalt become second in the kingdom." The righteous man answered and said, "Where have these words of thine been until today? Behold thou hast tortured me daily, for seven years, and I have three tines tasted death at thy hands, but my Lord Jesus Christ raised me up, and I escaped from the tortures which thou didst inflict upon me. If my Saviour but preserve my soul within me I will not only die once but thousands of times, and I will never hearken to such words as these. Dost thou know, O king, that the whole that the whole race of the Galileans loves victory ? and that they will fight against those who fight against them ? and behold thy words gladden me this day and thy speech greatly persuades me." When Daianus heard these things he rejoiced greatly, and kissed Saint George upon his head. The blessed man said to the governor, "Stand away from me, and kiss neither me nor my head until I have first worshipped Apollo, and after that do unto me what thou pleasest. And now command them to take me to the prison until to-morrow, and when to-day has gone and the morning has come, let the herald bid every one come to see me worship the gods." Then the governor answered and said to him, "Nay, far be it from me to throw thee into prison, O beloved George, and forgive me for all the sufferings which I have inflicted upon thee, for I was ignorant, and receive me as a father, and come with me into the palace where Queen Alexandra is in her inner chamber." So the governor took him in and put him in the room where the Queen was, and came out to the governors and sat at meat with them. And when the evening had come Saint George bowed his knees and prayed, saying, "O Lord God, there is none like unto thee among all the gods, thou art the Lord God and there is none that can be compared with thee. Why do the heathen cry out and the peoples imagine vain things ? The governors and the rulers of the earth have gathered together and they speak against God and against his Christ." The Queen answered and said to him, "O George, my master, who are these governors and rulers who are gathered together ? and who is the God Whom they resist ? and Who is his Christ ? teach me, O George, my master." And the blessed man opened his mouth and explained to her the deep questions of the Old and New Scriptures, and thus taught her to know the Father and the Son and the Holy Spirit. He showed her that it was God who had made the heavens, and the earth, and the sun, and the moon, and the stars, and all creation, and he showed her that the Lord had made man out of the dust of the earth, saying, "Did not God create him out of the earth ? If He did not, whence did he find bones and sinews, and skin, and eyes, and tongue, and throat, and the senses of hearing, and smelling and the creation of all these works ? Did not God make all these things and man out of a clod of earth ? And He filled him with understanding and wisdom of the true knowledge of God, and placed him in a paradise of joy, and gave him His commandments and His words to keep like a god. But the man was disobedient to his God, and his enemy persuaded him, and he died with him in sin and went down to Amenti with him, but not for ever. When God saw that which He had made in the snares of His adversary, for his goodness' sake He could not bear it, and He sent His beloved Son into the world and by the Holy Spirit He took upon himself flesh of the spotless Virgin and God-bearer, Mary: and she bore as man, God, perfect, in truth, and He was the only man without sin. And they crucified Him upon the cross by His own desire and by the good will of the Father and the Holy Spirit, and He died for us in the flesh that He might redeem us out of the hands of our enemy; and He returned again to His home which is the Paradise of joy. When the adversary, the devil, saw that mankind knew the true Creator, God, he entered into the governors and rulers of the earth and they made idols and called them by the names of images of devils, and they worshipped them and forsook God the most High their Creator." The Queen said to him, "Are not these idols demons, O George, my master, after God ?" The blessed man said to her, "Yes, they are foul demons." The Queen said to him, "O George, my master, the governor Dadianus knoweth no God except Apollo: and now show me how the Son of God came into the world." the blessed man George said, "Hearken unto me, O Queen Alexandra, and hearken unto David who says, "Thou that sittest upon the cherubim show Thyself, lift up Thy strength and come to deliver us." And again David saith, "He shall come down like rain upon the mown grass", that is to say to the Virgin. Listen, O Queen, to Habakkuk the prophet, who said, "O God, I heard the noise of Thee and I was afraid, and I gave attention to Thy words and was speechless;" now the Holy Spirit spake all these things." The Queen said to him, "Master, why did the prophet fear when he heard the voice of God, and why was he speechless when he considered His works ?" The blessed man said to her, "Listen, O Queen. The prophet was afraid because he knew that God would come down from heaven; and he was speechless because he knew that He would dwell with men." The Queen answered and said to him, "Verily thou speakest well, O perfect illuminator; I beseech thee to pray to God for me that He may drive away from me the snares of foul idols." The blessed George said to her, "Believe in the holy and consubstantial Trinity, and no blemish of idols shall in any wise come near to thee." The Queen said, "Master, I believe, but I am afraid of this sinful governor and evil beast, for in truth he devours the flesh of men and is more lawless than any other man living upon the earth. And, O George, my master, keep this secret until I come to thee in the court of Christ the mighty King; leave me now to rest myself a little, O holy father, and God knows that I will cling fast to thee." When the morning had come, the evil and lawless governor commanded them to bring the blessed man out to him from the palace into the temple of the city. And the governor sent to him, saying, "Haste thee and come forth to me and worship the gods that thou mayest receive great honours from the hands of all the governors; that they may give to thee a kingly sceptre; that my heart may be joyful in thee, O exceeding pleasant and beloved one; and that every one may see thee [sacrifice] before we go in to sit at meat". The blessed man said to him, "Sit thee down with the other governors here until I have sacrificed to the gods, and I will return unto thee." And the herald cried out with a loud voice saying, "Gather together to-day, O all ye people, into the temple that ye may see George the mighty Galilean worship Apollo the great god." And straightway the whole city was gathered together, both men and women and they all marvelled greatly at the blessed George the mighty illuminator, and said to one another, "What has happened to the righteous man?" When the widow woman [whose son Saint George had healed] heard these things abou the blessed George, she cried out among the whole multitude, saying, "O George, my master, the valiant soldier of Jesus Christ the King, my God, thou who hast wrought thousands of miracles and mighty deeds in this city; who hast raised the dead, given light to the blind, made the lame to walk, the dumb to speak, and the deaf to hear; who hast cleaned the lepers, and cast out devils, and hast been an enlightener of the whole world; O George, my master, who didst make the dried up pieces of wood to bear fruit again; who didst come into my house when I was poor, and I became exceeding rich, and who when I was wandering turned me to God the true Almighty; wilt thou, after all these things which thou has wrought in the name of Christ, worship Apollo the polluted, and put to shame the whole Christian people ?" When Saint George heard her say these things he rejoiced at the firmness of her faith, and he smiled a holy smile at her, and said, "Put thy child down upon the ground," and she put him down. The saint answered and said to the child, "Christ my God says unto thee, "Arise, come to Me and perform My words";" and straightway his ears heard and his legs received strength, and he came to Saint George. And Saint George said to him in presence of all the multitude, "Go into the temple of Apollo and say to Apollo, "O idol, blind, deaf, senseless and foolish one, come forth, for George, the servant of God, called thee";" and the little child went into the temple and spake thus. And straightway the spirit which sojourned in the idol cried out, "O Jesus the Nazarene, Thou drawest every thing to Thee. Why hast Thou now raised up this little boy against me ?" And straightway the idol leaped down from his pedestal and came to the righteous man George. And the saint George said to the idol, "I am not the God of the Christians". The demon said to the saint, "Bear with me a little, O master, and I will show thee every thing;" and Saint George said to him, "Speak". And the spirit said to him, "I am the God of the Hellenes and a demon of darkness, but of old times, master, I was an angel of God. Through my disobedience to God, He commanded, and heaven was shut against me, and I was cast out from it, and became a devil. And I was jealous of mankind, for God took them up to heaven and cast me down into the depths of the earth, and therefore I became an adversary of mankind and made them to forsake God and to worship idols that God might cast them down with us into the abyss." Saint George said to him, "O evil and wicked snarer, since thou didst choose darkness of thy own free will, why didst thou become an enemy of God's image ?" The spirit said to him, "I swear by the seven heavens of heaven, and the circle of the sun and the moon, and the orbit of the abyss, if power had been granted to me I would have led thee astray. And I go up to the gates of heaven, and I listen to the sentence of death which comes forth from the mouth of God, and I bring numbers of afflictions upon every soul of mankind; and I bring sleep upon men and women in church that they may not listen to the words of God and deliver themselves from their punishments." Saint George said to him, "O wretched one, thou hast laid hold upon me several times, but by the power of my Lord Jesus Christ thou didst find nothing of thyself in me; and now, O polluted one, receive the punishment which God shall bring upon thee for ever and ever." Then Saint George with his foot smote the earth which opened yawning down to hell, and he said to the spirit, "Go down into the abyss, thou and the idol in which thou sojournest, and give speech unto all the souls that thou hast led astray from God;" and straightway he went down into the abyss before every one, and the earth closed over him. Then the righteous man loosed his garments, and went into the temple, and made his way to the idol called Herakles, and said to him, "O wicked spirit who inhabitest this temple come forth from it, for I am George, and I have come against thee in wrath;" and straightway all the demons which dwelt in the idols disappeared. And Saint George loosed his shoe latchets and went against the idols upon their pedestals, and they fell down and became as dust, and he trampled upon them all with his feet. When the priests saw the destruction in the temple they rent their clothes, and went to the governors and showed them every thing that had happened. And they were filled with wrath and sent servants to bind Saint George, and they brought him to the governors with a whole multitude of people following after him, all crying out, "We are Christians, and we belong to the God of George." Then Dadianus the governor said to Saint George, O most wicked of all Christians, didst thou not swear to me last night, saying, "I will worship Apollo" ?" The righteous man said to him, "Go, O governor, and bring Apollo to me and I will worship him before thee." And again the blessed man said, "If thou wilt bring Herakles himself here I will worship him before thee". The governor said to him, "Where shall I find Apollo or Herakles, for according to what the priests have told me thou hast smashed Herakles to pieces and hast sent Apollo down into the abyss; and wouldst thou also send me thither alive, O George ?" Saint George said to him, "O senseless one, since thou art persuaded that they were not able to help themselves, how could they deliver thee in the great day of the True Judge when every one shall receive according to what he hath done ?" Then the governor was greatly ashamed, and rose up and went into the palace and said to the Queen, "O Queen Alexandra, I suffer much through this race of Christians, but especially through this magician George." The Queen said to him, "Have I not told thee, O pestilential flesh devourer, to let this race of Christians alone, for the King of Heaven is their God, and He is the God of heaven and earth and will humble thy pride straightway." The lawless governor said to her, "I think, O Queen Alexandra, that the magic of George, who came to thee, has entered into thee." And she said to him, "My Lord Jesus Christ has called me by the holy calling of George." When the lawless governor heard the name of Christ from her mouth, he was greatly enraged, and laid hold of her hair, and came forth to the governors: and he showed her all the sufferings which could be caused by the instruments of torture and brought her to the governors and told them everything she had said. Then the governors commanded to hang her naked upon the wooden horse, but she held her peace, and her eyes looked up to heaven, and she said to Saint George, "O George, my master, pray for me, for I suffer greatly." The righteous man said to her, "Bear patiently for a little, O Queen, that thou mayest receive the incorruptible crown from the hands of my Lord Jesus Christ." The Queen said to him, "Master, what shalt I do, for I have not received Christian baptism ?" The blessed man said to her, "Be of good cheer, for thou shall receive baptism in the fountain of thine own blood by the stroke of the sword;" and they straightway passed the sentence of death upon her, that her head was to be cut off by the sword. And when they took her out to take off her holy head, she cried out, saying, "Behold I have kept open the door of my palace [to Thee], O my Lord Jesus Christ, open to me the paradise of joy, and receive me to Thyself without shame." And when she had said these things they took off her holy head on the fifteenth day of Pharmuthi, and she received her crown incorruptible for ever. After these things the governors were gathered together to Saint George, and said to him, "Behold, O George, thou hast destroyed the Queen and hast gained an advantage over us." Magnentius the governor said to them, "Let us pass the sentence of death upon him lest he destroy us all." Then Dadianus the governor sat down and wrote the death sentence of the blessed man George, saying, "George of Melitene, the chief of the Galileans, hath set behind his back the decrees of the seventy governors of the whole world, the ministers of the victorious gods; we therefore command that his head be taken off with the sword; and know, O ye peoples, that we are guiltless of his blood;" and the seventy governors signed the sentence of death. And Saint George took his sentence of death in his holy hands, and came forth with gladness, rejoicing greatly. When he came out to the place where he was to consummate his martyrdom, he said to the soldiers, "Brethren, wait a little for me, that I may pray to my God for these seventy lawless governors, who, as ye know, have tortured me for seven years." Now the governors had left the saint and had prepared a feast, and were rejoicing at the death of the blessed man. Then the blessed man looked up to heaven and said, "O my Lord Jesus Christ, who didst make fire come from heaven by the words of Thy servant Elijah the Prophet and devour the two captains of fifty and their hundred soldiers, send down to me, O my God, of that same fire that it may devour these seventy lawless governors." And while the words were yet in his mouth, fire came forth from heaven and devoured the five thousand godless soldiers who served them. Now the soldiers who were with Saint George knew not of the matter until they had taken off his holy head. When the righteous man knew that the fire had devoured the impious ones, he bowed his knees, and prayed, saying, "O my Lord and God, the joy of my soul and spirit, the Father of my Lord Jesus Christ, hearken unto Thy servant George this day, and receive me to Thyself in Thy abundant joy. O my Lord, I see standing here a mighty multitude who think to take my body away with them when I shall soon have consummated my martyrdom. Thou knowest, O my Lord, that my body will not suffice for the whole world, but hear me, O Lord, at this present, and grant a favour to my name, that through Thee there may be salvation and help to all the the world; so that Thou, O Jesus Christ our Lord, together with Thy Good Father, and the Holy and Vivifying Spirit, mayest have the glory which is meet for Thee, for ever and ever, Amen." And when he had said, "Amen", the whole firmament was filled with the angels of the Highest, and our Lord Jesus Christ came to him seated upon the Cherubim and Seraphim, and the company of the Prophets and the Apostles, and the martyrs, and all the saints, and all the hosts of heaven were praising Him; and all the soldiers who were with the blessed man slept, and became as dead men. And the Lord said to the blessed George, "Hail, My George ! Hail, beloved of Myself and of My angels! Hail, champion of the kingdom of heaven ! Blessed art thou this day, O George My beloved, for I have made ready for thee seven crowns of glory in the hands of My Father, and He will place them upon thy head this day. Blessed art thou, O My beloved George, for I have prepared for thee a royal crown set with gold and pearls and I will put it on thy head with My own hands this day. Blessed art thou this day, O My beloved George, for there is prepared for thee a great and exalted throne beautifully set with exceeding fine gold and a true priceless stone, and they will seat thee upon it this day in the highest heavens by the Holy Ghost. Blessed art thou, O My beloved George, for the pearly gates of the tabernacles of light are open to thee, and thou shalt go into the presence of the Holy Trinity and none shall prevent thee. Blessed art thou, O My beloved George, the valiant one, for My Good Father has written thy name upon the chariot of the Holy Trinity, that whosoever shall say, "o God of George, help us, hear us," them thou shalt hear straightway. Blessed art thou, O My beloved George, for thou didst confess My name, and the Good Father, and the Holy Ghost, before the governors of the whole world, and I will confess thee in heaven where thou shalt be in great light. And I say unto thee, O My beloved, that inasmuch as among all mankind and in the whole world there was, for three years, no one able to confess My name, neither elder, nor deacon, nor a lay person, except thyself alone, and thou didst stand up before the seventy governors of the whole world, I swear by My right hand, O My beloved one, that I will establish a covenant with thee that when thou shalt bow thyself upon thy spiritual face in heaven and shalt come with all thy congregation to worship the holy trinity, all the saints shall know thee by reason of the honour which I will show thee, O My beloved, and they all shall know that thou art George the beloved of God, and shall adore thee according to the command of My Good Father. And moreover, behold now My beloved, I have joined thy name to Mine, that it may be a haven of safety throughout the whole world, that every man or woman who shall happen to be in danger by judgements, by executioners, by prisons, by seas, by waters, or in harbours, or by travelling, by attacks, by thieves, by wild beasts, by fire, by lions, by violent death, by any necessity, by a multitude of deep afflictions, or in short by any afflictions whatever that befall the children of men, and they cry up to Me in thy name three times, saying, "O God of George, help us," I will hear them quickly and will fulfill every thing that they shall ask with their heart. The name of every one who shall build a martyrium in thy name, or who shall cause a book of thy sufferings and thy contests to be placed in a church for reading in thy name, will I write in the Book of Life, and I will cause him to be in the same place with thee in My kingdom forever. Whosoever shall make a gift, or an offering of first-fruits to the church in thy name, or who shall feed the poor in thy name, or the widow on the day of thy glorious commemoration, to him will I give help in this world, and I will make him to enjoy with thee the good things of My kingdom. Whosoever shall clothe one naked person in thy name, him will I clothe with the garments of heaven. Whoever shall burn a lamp in the church in thy name or a little incense, upon him will I make My angels shine when he shall come to Me in joy. Whosoever shall give thy name to his son in faith, his heart will I comfort within him. Whosoever shall receive a stranger in thy name, his sins will I forgive him, and I will receive him into My kingdom for ever. And I swear to thee by Myself, O George My beloved, as I have already said to thee, so I now say again to thee, that among those born of women there is none like unto John the Baptist, and that among the company of martyrs there shall be none like unto thee, neither among those who have been, nor among those who shall be. And now hasten, My beloved, and fulfil thy dispensation that I may take thee up with Me upon the chariot of the cherubim, and give thee as a gift to My Good Father and the Holy Spirit; and all the angels of heaven will rejoice with thee, for they are awaiting thee. As concerning thy body I will now cause an earthquake to take place that no man among these multitudes may take thy body away with him until thy servants come to carry it away. And behold, I have already taken thy mother, and thy two sisters, and thy bride, who was betrothed to thee, to My kingdom before thee that they might not see thy death in this world, but that they might see thee, and thy father, and thy dear [adopted father], and the great glory which I will give thee in My kingdom; and behold, for thy sake, I have destroyed the lawless governors of the whole world. When thy blood has been poured out upon the ground, the service of idols shall cease, and men shall glorify My name throughout the whole world. I will cause thy kinsman to build a shrine for thee in thy city and to lay thy body in it with honour. And after a short time Satan will stir up a persecution against the churches, and the blood of thousands of martyrs throughout the whole world shall be shed. And when twenty-one years have gone by, the impious governor of that time shall take counsel to destroy thy holy shrine by reason of the mighty deeds which I will work by thee in thy holy shrine. And he will send a general with his soldiers to do this thing, but I will cause thee to destroy him by an exceeding violent death, even as thou hast destroyed these governors, and the persecution shall cease through thee. And I will send thee to destroy that impious governor, and I will seat another in his place according to the command of My Good Father. And he shall build for thee a splendid and beautiful shrine, and he shall glorify thy church; and the whole world shall serve me in freedom for ever. And I will build thee a multitude of shrines throughout the whole world; I will make all the nations of the world to glorify thee; I will make thy name to fill the whole world; I will make a multitude of gifts to thy shrine; and I will make men to celebrate thy festival in the whole world and especially the day of thy commemoration, which is the day of the consummation of thy martyrdom. I will make all creatures upon earth to enjoy this day; and I will crown the fruits of the earth on the day in which thou art crowned; and on the day of the dedication to thee of the first-fruits of the earth, which is the seventh day of Athor, thy name, O My beloved George, My valiant soldier, shall be exalted in heaven and glorious upon earth for ever and ever, Amen." And when the Lord had said these things to him, He filled him with power and joy, and the blessed man rejoiced greatly and exulted, saying, "I thank thee, O my Lord Jesus, that thou hast honoured me more than I deserve;" and the Lord made the sign of the cross over him, and disappeared from his sight. Then the holy man roused the soldiers, saying, "Come, my brethren, and perform that which has been commanded you:" and he straightway stretched out his neck and the soldiers took off his holy head, and there came forth from it blood and milk. And the Lord caused Michael to receive the blood and milk in his garment of light, and the Lord received his soul in to His own hands, and embraced it, and He wrapped it in the purple of the aether and ascended into the heights with it. And the whole firmament was filled with the holy angels and the company of the saints, and they hymned it until the Lord gave it as a gift to His Good Father and the Holy Spirit. And He put upon it a garment of light and an excellent diadem of gold set with precious stones, and there were seven crowns upon the diadem wrethed with the flowers of the tree of life, and the Lord wrote his name with the first-born for ever. And He caused the whole company of heaven and all the bands of the saints to seat him upon a throne and to celebrate a festival with him in the heavenly Jerusalem. And after these things there were earthquakes and thunders and lightnings and violent rains, and all the people who were standing by and the soldiers fled into the city. But Pasikrates the servant of Saint George stood outside beside the body of his master and wept over him, and there was neither rain nor storm in the place where the body of the saint was, but the whole place was full of light. Then the two servants of Saint George who were in the city, came out to their fellow-servant who was outside weeping by the body of their master, and when they saw that they had taken off his head, they straightway cast themselves down upon him, and worshipped him, and wept; and Pasikrates told them everything that the Lord had said to their master, and they were exceeding glad. And they joined his holy head to his blessed body, and the head clave to it as if it had never been cut off from it; and there was no mark of the sword stroke left on it. And his servants said to one another, "Verily God hath received our master unto Himself, and He will perform for him everything that He hath promised him." Then they took the holy body sprinkled with incense and carried it into the house which they had hired for seven years, and there was no one in it except themselves, and they hid it there. And there was darkness and an earthquake, and the sea rose up over the city wishing to submerge it; and the faithful who had heard the words of the Lord when He spake with the blessed George, cried out, "O God of George, help us in this need;" and straightway the sea went down and the storm ceased, and the sun came forth. And on the morrow the servants of St. George sought after the governors, and when they found that the Lord had destroyed them there was great joy throughout the whole world, and they opened the doors of the churches again everywhere. Then the servants of Saint George bought exceeding fine napkins and very precious incense, and they carefully prepared the body of their lord for burial, and carried it secretly through the city, and laid it in a ship, and brought it to Diospolis together with the account of his sufferings. And they found that the relatives of Saint George had gone to their rest in God. Now there was there a man called Andrew, the brother of St. George's mother, and he received the body of the saint into his house rejoicing greatly. And the whole city was gathered together and they built a shrine to him in St. George's own house, and they sent to Jerusalem and brought the Archbishop, Abba Theodosius, who consecrated it on the seventh day of the month Athor, and they laid his holy remains in it. And on this same day, that is to say, the seventh day of the month Athor, they celebrated the holy sacrifice of the holy body and glorious blood of our Lord Jesus Christ; and many signs and miracles took place in the holy shrine of Saint George. And Saint George came down from heaven according to the command of the Lord, and destroyed Euchios the general, and plucked out the eyes of Diocletian, and drove him forth from the palace, and set Constantine the emperor on the throne in his stead. and Constantine opened the churches throughout the whole world. And he went into the shrine of the Church of the Resurrection of our Lord in Jersusalem, and prayed there, and he went into the shrine of Saint George with his mother Helena, and his sister Eudoxia, and Saint George appeared to him by night, and told him what he should do. And he built the holy shrine of Saint George in Diospolis, which formerl was small, and made it beautiful, and it is that in which the many signs and mighty deeds which are written in other books than this took place. And they glorified God and His holy martyr Saint George, who consummated his strife on the twenty-third of the month Pharmuthi at the ninth hour of the day of preparation, and all those who were martyred through Saint George, being twenty-eight thousand six hundred and eighty, and Alexandra the Queen, and they received the incorruptible crown through our Lord Jesus Christ, and they now delight themselves with Saint George in Jerusalem the city of all the saints. And behold now, [my brethren] we have hitherto only made known to you concerning the sufferings and the honourworthy strife which Saint George the victorious warrior of our Lord Jesus Christ endured patiently; but let us now consider the exalted honours which he received in heaven through our Lord Jesus Christ. Hear then, O beloved, what I the feeble Theodotus, have seen with my own eyes and heard with my own ears. It came to pass in the time of the God-loving emperor Theodosius of glorious memory that on the first day of his regn he saw a marvellous thing, he saw saint George come from heaven with great glory and the archangel [Michael] with him, and he seated the God-loving emperor Theodosius upon the throne of the Greeks, and his faith within him was strong in Saint George all the time [of his rule]. And when he had reigned twenty years he built a large church to the name of Saint George, and he gathered together all the bishops to the consecration of the church of Saint George, and he sent for all the bishops and even for my feeble self, a weak old man. And when we had consecrated the holy church in the name of God and of Saint George, the precentor (?) sang the psalms in their proper order, and the emperor and his nobles and the whole city were with us. And after the emperor and the whole multitude had sat down, he commanded the martyrdom of Saint George to be read, for that day was the twenty-third of Pharmouthi, and we listened breathlessly. But when the reader came to that place where God testified to Saint George, saying, "There is none like unto thee among all the martyrs, neither shall there be any like unto thee for ever," the subject puzzled me, and I said, "Since so many generals and eparchs and governors of this world have forsaken all the glory of this world, and their rank, and wealth, and have died for the name of our Lord Jesus Christ under the impious and lawless emperor Diocletian, how can this holy martyr be more exalted than they all ? When we had celebrated the Holy Communion and the evening had come, we lighted a lamp for the emperor, and lay down to sleep, and neither the emperor nor any of the others did eat, but he slept with us in the holy church. Now it was the evening of the Lord's day, for the consecration of the church took place on the Sabbath day. And when the night had come and we had, as was meet, performed the office for the night, and had said, "Amen", we sat down to speak of the mightiness of God, and the emperor came with us. And one of our fathers, a bishop, was taken up to heaven in a vision, and he saw most exalted mysteries the which it is not lawful for an earthly being to utter. He said, "I saw that I was standing before the throne of the Father, and I saw thousands of thousands, and myriads of myriads praising the holy Trinity, and coming in bands, and they worshipped God, and glorified Him and blessed Him, and made their requests, and afterwards they stood in rows, and no earthly creature could describe the glory and the great honour which they had received from the Trinity. And I saw one coming forth from within the veil like unto a king wearing a diadem of gold with seven crowns upon it, and he was riding upon a white horse, and he was many times brighter than the sun, and was equipped with sword and armour and the apparel of a king; in short his kingly dignity was immeasurable. And when he came forth a mighty multitude followed him on this side and on that, and I saw all the saints bowing down before him, and when I looked I was speechless, and I wished to know who he was. And I looked on my right hand and I saw a monk standing having wings like an angel of God, and he wore a kingly crown and raiment the like of which there is not among the kingdoms of the world, and he had a golden staff in his right hand, and his face was full of joy, and great glory surrounded him. And I besought him, saying, "My father, I beseech thee to show me who thou art that art in such honour as this." And he embraced me and said to me, "I am Paul of Tamma, and well hast thou come, O shepherd of our true King, our Lord Jesus Christ;" and when he had said these things to me I rejoiced that I had found freedom of speech before him. And I said to him, "O master, my holy father, inasmuch as thou hast deemed me worthy of thy holy salutation, I bessech thee to tell me who is this great king that has just come, to whom all this multitude has bowed the knee ?" Then the blessed man broke into a spiritual smile and he said to me, "Knowest thou not who this is ?" And I said to him, "O father, how should I know who this is since I have never seen him before ?" He answered and said to me, "I have been sent to thee to make thee certain of the things which thou didst ponder over in thy heart yesterday in the church concerning Saint George, the beloved of God, the chosen martyr exalted above all the saints according to the words of our Saviour. The works of every soul which comes forth from the body, whether of righteous men or whether of sinners, are manifested forth on the spiritual tablet and the soul is in its presence always, and its deeds are written upon it. When it pleased my Lord Jesus Christ to take me, His servant, to my rest and to visit me, I came forth from the world, and He esteemed me worthy of His goodness, and He brought me into His city, and I saw this being whom thou hast seen. And he had on this royal diadem with seven crowns above it, and I looked upon it and read the writing which was upon it, which said, "I am George of Melitene, from Diospolis, who died three times for the name of our Lord Jesus Christ," and I saw all the saints bowing their knees before him. Now I had endured many sufferings for the name of our Lord Jesus Christ and died four times, and I said within myself, "Behold, I am equal to him in honour", and I refrained from bending the knee to him. And straightway, in a moment, He who knows the hearts of all men sent the Archangel Michael to me who said, "O excellent Paul, why hast thou not taken part in the spiritual salutation according to the command of the Almighty? ", and I told him what was in my heart. Then he took me immediately to the holy Apa Noub the confessor, who had been both a monk and a martyr, and he showed him the command of God. The holy confessor said to me, "O Paul my holy father, go and perform the command of God, and say not, I have suffered like the mighty George, for thou, of thine own free will, [didst suffer] greatly; but that just man did for God's sake suffer by axes, by double edged hatchets, by saws, by nails, by fire, by two edged swords, and by the mouths of wild beasts. And I say unto thee, O my beloved one, that when the attendant cometh and sayeth unto thee, "The Lord calleth for thee, come," is not thy going better than seventy years of a monk's life in his cell ?" When I heard these things I changed my mind through the words of the archangel and the holy man and I said, "Forgive me"; and they rejoiced with me, and I went to the holy nartyr of Christ and straightway made obeisance before him. [And the holy man said], "O faithful shepherd of Christ, console thyself, for there is no one like unto thyself among the martyrs who are crowned [except] Saint George himself." And while the holy man (Paul of Tamma) was talking with me, Saint George the soldier of Christ came up to me with his face beaming with rays of light, and he saluted me and filled me with joy and gladness, and said to me, "When thou goest to thy city Ancyra, build thou a temple to me in it, that I may come and dwell with thee, for it will be one hundred and five months before thou shalt come to me in this holy city." When he had said these things to me I rose up straightway from my vision." When the emperor and the twelve bishops saw the radiant face of that bishop they knew that he had seen a revelation, and they entreated him to tell them what he had seen. And he, as his mind came to him, told them all the vision he had seen, and they marvelled greatly, and glorified God and the holy martyr Saint George. And the emperor answered and said, "On the day when God seated me, unworthy though I be, upon the Roman throne, I saw with my sinful eyes, Saint George with glorious visage come from heaven holding a sceptre of gold in his right hand, and the archangel Michael was with him. And I saw a diadem of gold and seven crowns upon his head, and he shone a thousand times brighter than the sun, and he came to me filled with joy, and took hold of me, and seated me upon the imperial throne, and a number of the nobles of the army saw him face to face. And I saw him again in his holy church and he showed me things that would do good to my soul." Now when I (Theodotus) heard these things, I blessed my Lord Jesus and his holy martyrs. After these things that bishop went to his city and buit a beautiful church in the name of God and Saint George, and consecrated it with his own hands before he came out of the body. Now that bishop was one of the three hundred and eighteen bishops that were gathered together in Nicea; and he filled the office of bishop for seventy-five years, and he died in God when he was one hundred and eighteen years old. Behold now, O beloved brethren, we have told you these things of the great honours which God has vouchsafed to the valiant soldier of strength, the mighty athlete, Saint George, whose festival is celebrated this day throughout all earth and heaven, and of the remainder of his glory and of the mighty and exalted honour he holds in the heavenly Jerusalem, the city of Christ the King. And now O beloved, blessed of God, since we know of a truth that Saint George has drawn nigh to God in this manner and has obtained freedom to enter into the presence of the Holy Trinity at all times and to show favour to every one, let us make ourselves champions, through love, of our poor brethren and strangers; let us love one another, let us keep innocence, and it shall come to pass to all of us, O beloved, that Saint George will, through our Lord Jesus Christ, show favour to us, and have compassion upon us, and forgive us our sins, and bless the gathering together of our people, small and great, old men and young men, and widows and virgins. And, finally, may He bless him that took the charge of preparing this book and of finishing it in true suffering through Jesus Christ our Lord, to whom be the glory meet for Him and His Good Father, and the Holy, and vivifying, and consubstantial Spirit, (who are) with Him, now and always and to eternity of all eternities, Amen.